← New Western Mural Installed in Wright City, MO! 2011 Washington Christmas Print Now Available! The fifth image in my Washington Christmas series is now available. 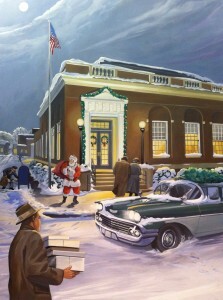 In partnership with Downtown Washington Inc, the newest painting is titled “Christmas Rush at the Post Office”. The new scene is available for purchase at the downtown Post Office, The Art Center on Main Street and at the Ray Harvey Art ETSY store on-line. The 16″ x 20″ signed print is retail priced at $60. This painting depicts a 1961 evening when last minute shoppers are rushing to mail Christmas packages. Santa is also sneaking into the building under the watchful eye of the local mailman. This is a big year for the historical building since its purchase and renovation by Downtown Inc. In addition to the new prints, the four previously published images are available in 5″ x 7″ Christmas cards. The original painting will be on display downtown and is also available for purchase. Anyone interested can contact the artist for cost and delivery. 2 Responses to 2011 Washington Christmas Print Now Available! Love your old prints of Washington. My family and I moved away 24 years ago but still love the old pictures of Washington. I plan on purchasing this print. Carla, I’m happy to say I hear this response often regarding this series. Thank you, its appreciated. Merry Christmas!